DeZiel Heating & A/C is the dependable name to call when you need a West Metro, Wright County, and Buffalo Air Condition Repair. We know the feeling when the AC goes out during a hot summer day. But you don’t have to sweat over a unit that’s on the fritz. Our team of certified technicians in West Metro, Wright County, and Buffalo are here to help. We have experience working with just about all makes and models, and we can get cool air flowing again quickly and efficiently. 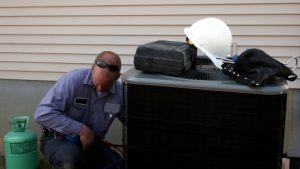 For West Metro, Wright County, and Buffalo, MN, air condition repair, contact the professionals at DeZiel Heating & A/C. We take a methodical approach when it comes to determining what’s wrong with a unit, and then find the right solution. If it’s something that can’t be reliably fixed, we’ll let you know up front. Give a call to our team in West Metro, Wright County, and Buffalo, MN, to set up an appointment. Nothing At All – Generally this could be an electrical problem. This could range from blown breakers to new batteries in your thermostat. Only Blowing Air not Hot or cold – Then there is a situation with the exterior unit. Perhaps a bad motor, condenser or low on refrigerant. Not Working Properly after Thermostat Replacement – A lot of people think that replacing a thermostat is a easy task. Truth is if you get your wires crossed then you are headed for a big problem. Know your wires and what they are used for. If you need help give DeZiel Heating & A/C a call. We’re a locally owned and operated company that’s committed to providing excellent service to every one of our valued West Metro, Wright County, and Buffalo clients. We offer flexible hours for convenient appointment scheduling. Since A/C units can go out at the worst possible time, we also offer 24/7 emergency response. We believe in being punctual when we arrive for a job and we strive for a prompt completion without cutting corners. Our technicians will also be happy to answer any of your questions about the steps they’re taking to fix the problem. If you are looking for Air Conditioning Repair Services then please call 763-684-3965 or complete our online request form.